You are here: Home / Misc. / Book Club/Book Reviews / Four Women: The Novel Explained. 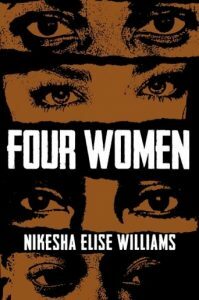 Four Women: The Novel Explained. (ThyBlackMan.com) Five years ago Trayvon Martin was shot and killed in Sanford, Florida by an overzealous, prejudicial, profiling neighborhood watch captain. The 17-year-old was immortalized for wearing a hoodie home from the convenience store where he picked up an iced tea, and a bag of skittles to munch on while watching the All Star game. His killing and the lack of justice that followed in avenging his murder in the criminal justice system galvanized a nation of oppressed Black and Brown people to ask the question and then demand Black Lives Matter. As a Black woman the black and white image of Trayvon in a hoodie haunts me. As a journalist it angers me. Too many times I have had to use an image just like his to tell the story of another black boy, teen, or man who was taken too soon. As a writer, an author, a creative Trayvon’s face inspires me. I have looked in the haunting eyes of Trayvon Martin, Jordan Davis, Sandra Bland, Rekia Boyd and dozens upon dozens more of unarmed African-American men, women, and children killed and have felt sadness, rage, and inspiration. I wanted to know more of their stories, more of their lives, more of who they were as people and not caricatures of themselves in obituaries. The want to know their stories is what inspired the creative inside of me to write my own; to explore the intersection of race and gender in an age of unabashed police brutality and domestic violence. My novel Four Women begins with a simple question: What happens when your present meets your past and the world is watching? Soleil St. James, Dawn Anthony, Ebony Jones, and Dr. Jonelle “Johnnie” Edwards all live, work, and love in Jacksonville, Florida. The women from four different backgrounds don’t all know each other, but when one tragically triumphant event brings their worlds together the women’s jobs, relationships, and exponentially budding connections get tested in ways they’ve never imagined. In a post Ray Rice, Trayvon Martin, Jordan Davis, and Michael Brown world Soleil, Dawn, Ebony, and Jonelle all question their place as African-American women. Are Black women still the mule of the world as Zora Neale Hurston posited more than 80 years ago? When the races are the same and the roles are flipped Four Women asks if justice can be served when the suspect is also the victim? In a world where stand your ground is immunity from prosecution for murder, or a license to kill, and domestic violence is scarcely recognized, what options does any one woman have? My curious inspiration was born out of tragedy and I hope it inspires conversation. The novel Four Women will be released November 23, 2017. The first 12 chapters are available now at www.newwrites.com/book. One may also connect with this sister on Facebook; http://Facebook.com/NikeshaElise and also Twitter; http://Twitter.com/Nikesha_Elise.